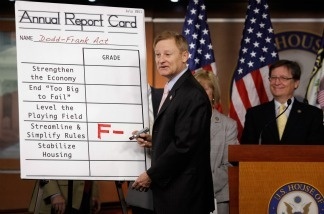 House Financial Services Committee Chairman Spencer Bachus (R-AL) adds a grade of F- to a 'report card' for the Dodd-Frank Act one year after the legislation passed July 15, 2011 in Washington, DC. The Dodd-Frank Wall Street Reform & Consumer Protection Act was intended to be a direct response to conditions that helped to set off one of the worst recessions in American history—decades worth of bad home loans, nefarious investment activities on Wall Street and lax regulations were supposed to be addressed in this sweeping piece of legislation that had the end financial user, usually the average American consumer who had a retirement plan or who owned a home, in mind. One year later and not much as been done to implement Dodd-Frank, let alone taking steps to protect consumers of financial products. 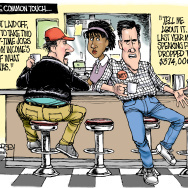 The victim of partisan bickering in Congress, Dodd-Frank has lied largely dormant since last year with fights over who should lead the new Bureau of Consumer Financial Protection and the language of regulations to be written up by the FDIC and the Federal Reserve. There are two-dozen bills pending in Congress to do away with parts of Dodd-Frank, presidential candidates are now blaming the bill as part of the reason that economic recovery has been so slow and business groups continue to call Dodd-Frank a “job killer.” How did a well-intentioned piece of legislation, meant to look after the little guy caught up in a brutal recession, become such a political football and why has Dodd-Frank achieved so little in a year?